Our carefully crafted exclusive unisex polarized sunglasses with decorative bling provide a unique combination of technical performance and design. AESTHETIC: Beautiful ergonomic design for efficiency, comfort & enjoyment. LENS: Anti-reflective & anti-glare. Gradient. Photochromic. Mirror. UV400. Impact-resistant & shatterproof. Reduces visual fatigue. Nice gloss. Easy to clean. High-grade TAC. 58 x 52 mm (W x L). FRAME: Lightweight, durable & sturdy. Ergonomic design for efficiency & comfort. Exquisite workmanship. Smooth opening & closing of the temples. Integrated design of nose pads & frame for a stable hold. Comfortable on the nose bridge. Outstanding anti-slip performance. Excellent shape, stylish, perfect fit, well-defined lines. High-grade stainless plastic. 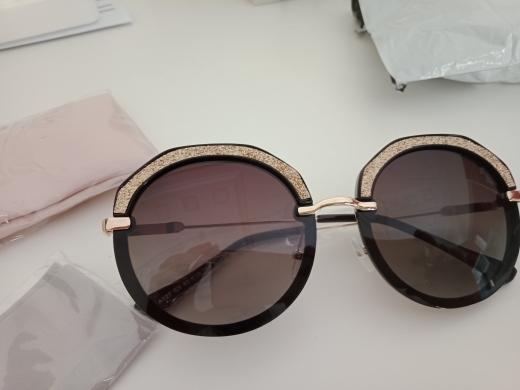 Very beautiful, modern sunglasses. Arrived fully intact. Packed in carton. Highly recommended! I have no complaints regarding this item. 5-star evaluation! All good! Excellent, cool sunglasses. This is not the first time I bought from this store. All is fine. Good quality and service, as always. Excellent glasses at an excellent price. I recommend this store.